It seemed like a mad idea in March and I was starting to wish I was sowing all my veg in rows this year when the beetroot germinated poorly and I was worried that my calculations of how many plants I would need for my beds of flowers and veg in circles looked like they were falling short. But now, as the plants are growing and the patterns are becoming clear, all is well. 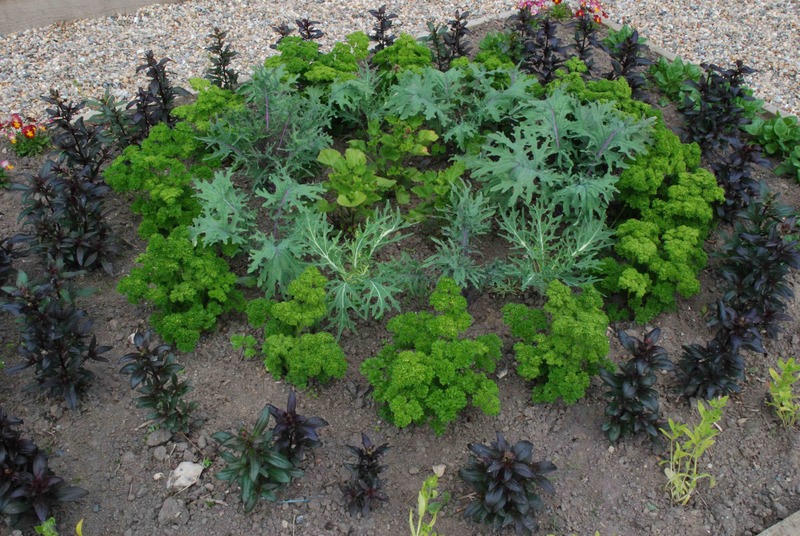 A ring of parsley surrounds ‘Peacock’ kale and ‘Bolshoi’ kale around pelargonium ‘Lord Bute’. Around that is a circle of home-saved antirrhinum ‘Constantine’. There is no real tactical reason for growing the flowers and veg in circles except that I hope it will look nice. 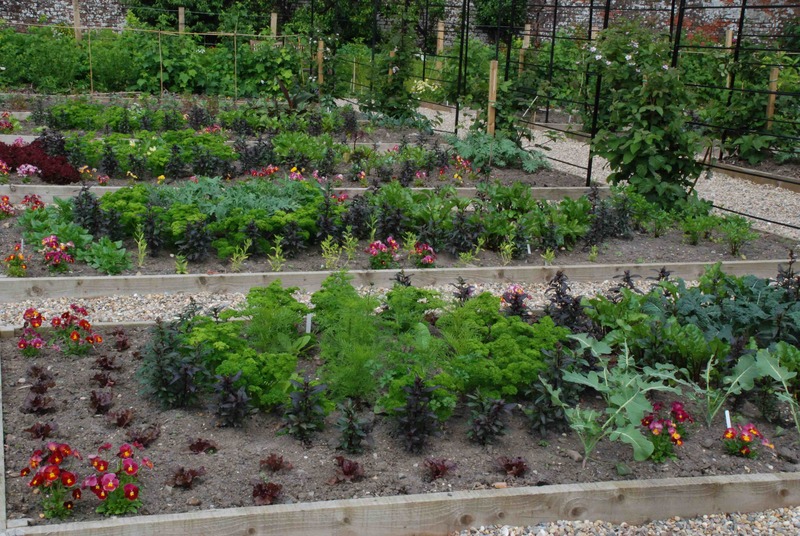 Last year the beds had rows of veg and flowers and it looked fine. But I suppose gardening is all about pushing the boundaries and I wanted to try something different. Making the beds match and wanting some plants to appear in all the beds meant they had to be veg we could use lots of so beetroot and parsley had to be the main veg plus lettuce which I am growing in several varieties. 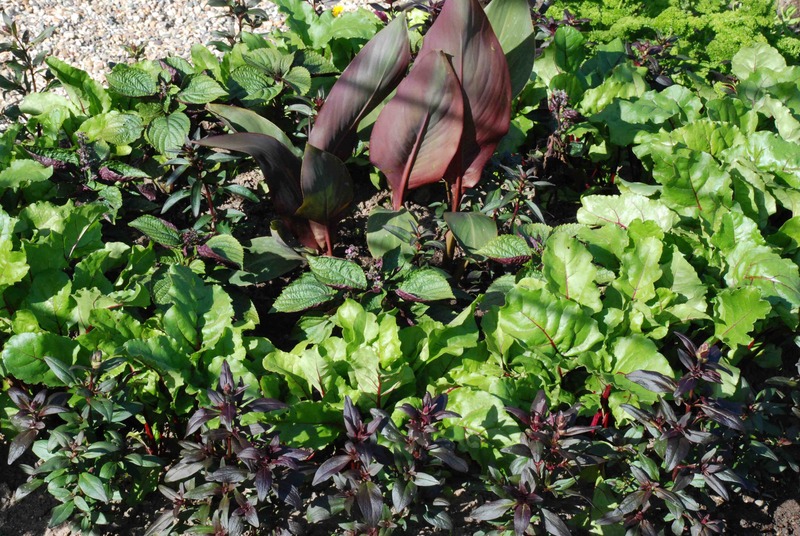 A ring of beet surrounds a rich planting of red and green perilla and antirrhinum ‘Black Prince’ with a canna in the centre. All surrounded with ‘Constantine’ antirrhinums. They have been more fiddly to plant than in rows and weeding is a bit slower but now that they are starting to close in and cover the soil the plants will need less weeding (I hope). Outer beds are all circled with contrasting antirrhinums and parsley and inner beds ringed with beetroot in various colours. This is a brilliant idea! It looks really beautiful! This is so brilliant. How did you decide which veg to put in each one? Well I wanted something that would be longlived for the main circles so I chose beetroot for most – it can be thinned out throughout the season. And parsley was the others. The centres are filled with other veg and flowers and I tried to colour theme things. I will be posting more pics in the next week or so as the plants are growing and looking better. Thank you – hopefully the next set of pics will look even better. Thank you for commenting 🙂 I appreciate it. Your garden looks amazing. Definitely will give this a try.